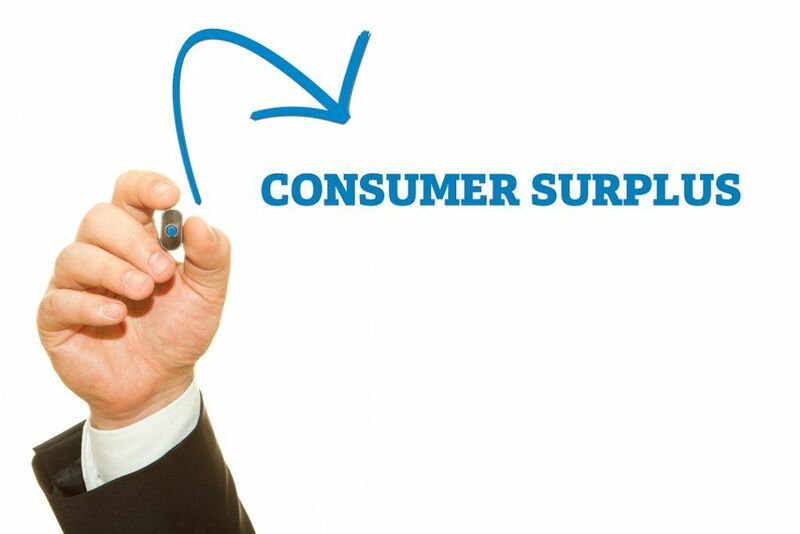 Consumer surplus, also known as buyer’s surplus, is the economic measure of a customer’s benefit. It is calculated by analyzing the difference between the consumer’s willingness to pay for a product and the actual price they pay, also known as the equilibrium price. 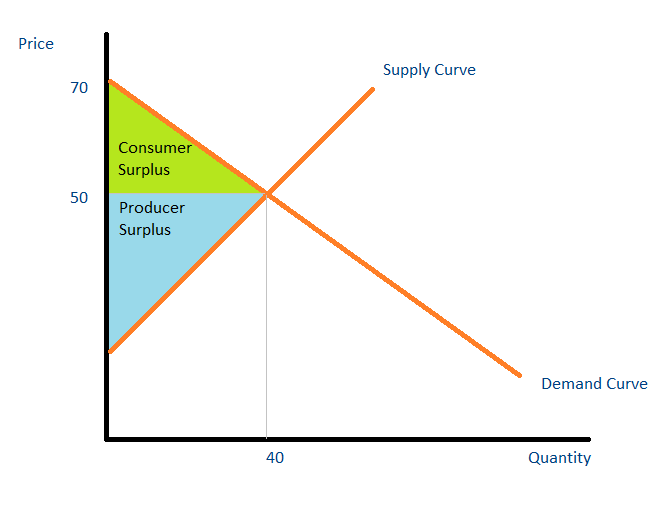 A surplus occurs when the consumer’s willingness to pay for a product is greater than its market price. Consumer surplus is based on the economic theory of marginal utility, which is the additional satisfaction a person derives by consuming one more unit of the product or service. The satisfaction varies by consumer due to differences in personal preferencesBuyer TypesBuyer types is a set of categories that describe the spending habits of consumers. Consumer behavior reveals how to appeal to people with different habits. By theory, the more of a product a consumer owns, the less willing he/she is to pay more for the product due to the diminishing marginal utility derived from the product. The point where the demand and supply meet is the equilibrium price. The area above the supply level and below the equilibrium price is called product surplus (PS), and the area below the demand level and above the equilibrium price is the consumer surplus (CS). While taking into consideration the demand and supply curvesDemand CurveThe Demand Curve is a line that shows how many units of a good or service will be purchased at each possible price. The price is plotted on the vertical (Y) axis while the quantity is plotted on the horizontal (X) axis. Demand curves are used to determine the relationship between price and quantity, the formula for consumer surplus is CS = ½ (base) (height). In our example, CS = ½ (40) (70-50) = 400. Consumer surplus for a product is zero when the demand for the product is perfectly elastic. It is because consumers are willing to match the price of the product. When demand is perfectly inelastic, consumer surplus is infinite because a change in the price of the product does not affect its demand. It includes products that are basic necessities such as milk, water, etc. Demand curves are usually downward sloping because the demand for a product is usually affected by its price. With inelastic demandInelastic DemandInelastic demand exists when the consumer’s demand does not change as much as the price. Inelastic demand often affects commodities and staple goods., high consumer surplus is high because the demand is not affected by a change in the price, and consumers are willing to pay more for a product. In such an instance, sellers will increase their prices to convert the consumer surplus to a producer surplus. Alternatively, with elastic demand, a small change in price will result in a large change in demand. It will result in a low consumer surplus as customers are no longer willing to pay as much of the product or service with a change in price. The consumer surplus theory suggests that the value of utility can be measured. Under Marshallian economics, utility can be expressed as a number. For example, the utility derived from an apple is 15 units. There are no available substitutes for any commodity under consideration. It states that customers’ tastes, preferences, and incomeRemunerationRemuneration is any type of compensation or payment that an individual or employee receives as payment for their services or the work that they do for an organization or company. It includes whatever base salary an employee receives, along with other types of payment that accrue during the course of their work, which do not change. It states that the utility derived from the income of a consumer is constant. That is, any change in the amount of money of a consumer does not change the amount of utility they derive from it. It is required because without it, money cannot be used to measure utility. It states that the more a product or service is consumed, the lower the marginal utility is derived from consuming each extra unit. The marginal utility derived from the product being consumed is not affected by the marginal utility derived from consuming similar goods or services. For example, if you consumed orange juice, the utility derived from it is not affected by the utility derived from apple juice. Consumer surplus is a good way to measure the value of a product or service and is an important tool used by governments in the Marshallian System of Welfare Economics to formulate tax policies. It can be used to compare the benefits of two commodities and is often used by monopolies when deciding the price to charge for their product.